Alocasia Borneo Giant is commonly mistaken for Alocasia Robusta. Aloscasia Robusta has a bluish look to the leaves as well as the stems. Robusta is a bit hard to grow because it needs more heat and grows much slower. Alocasia Borneo Giant has been thought to be a strain or form of Macrorrhiza, they can easily be told apart once mature. 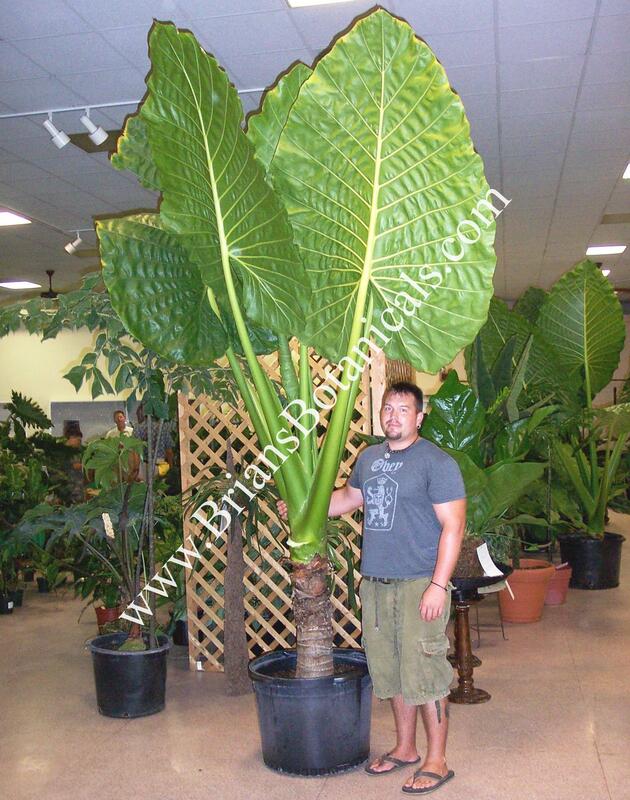 Alocasia Borneo Giant grows 2 to 6 feet the first year. The following year it may grow anywhere from 8 to 15 feet tall once mature. On the leaves of an Alocasia Borneo Giant you will see a ripple effect. As the leaves mature they will lean slightly rather than point straight upward. This plant get much larger, than most macrorrhiza types, before producing trunks.Over all Borneo Giant is a very fast, strong, and tough plant. I have grown it in full shade and full sun. It is a big eater and can grow at an almost impossible rate if feed well. This is one tropical plant I would recommend for northern growers. It is not difficult to remove the leaves and store, plus the size makes it unbelievable in a northern garden.